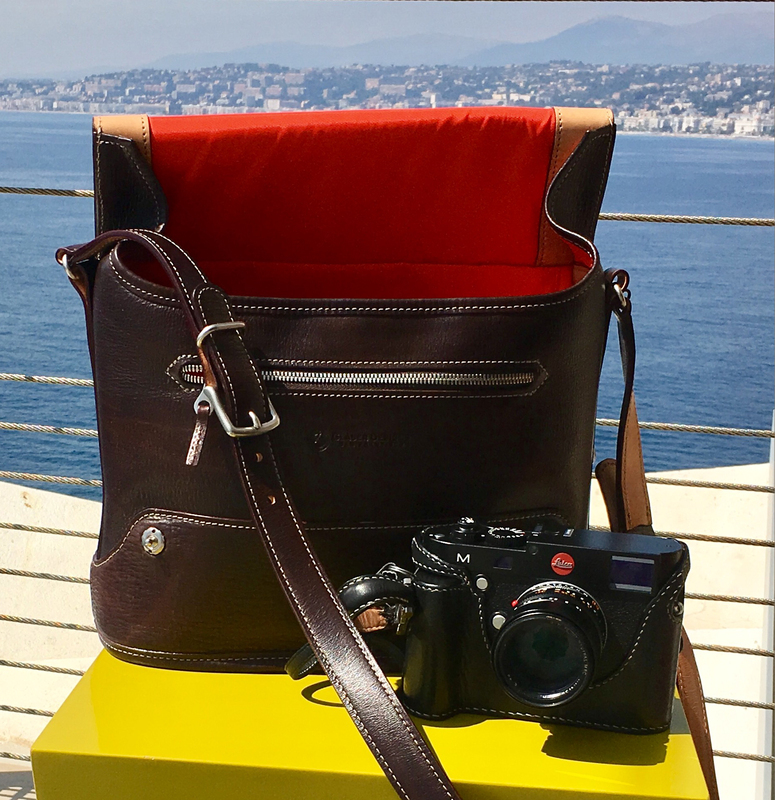 You can alternate your optional camera insert with your backpack’s supplied laptop sleeve and optional organizers to reformat your backpack for carrying work, travel, overnight gear, tablets and accessories. 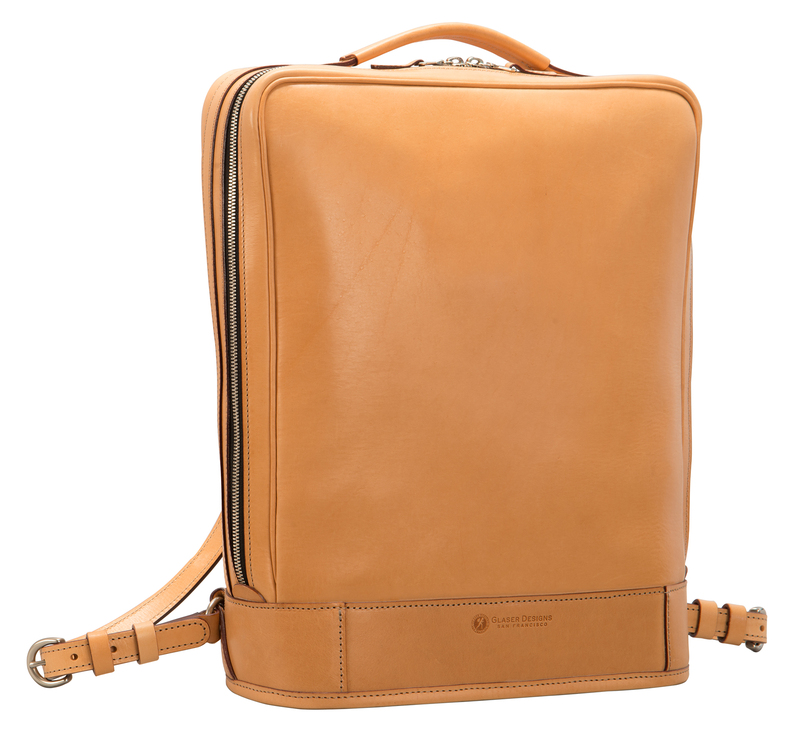 Link here to see our Business Backpack. 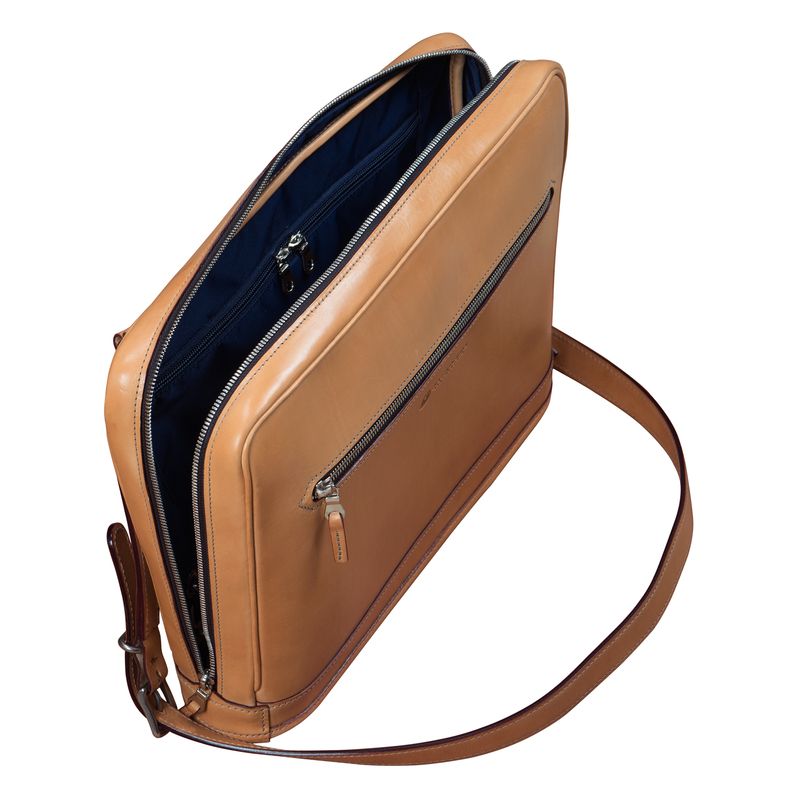 backpack’s supplied laptop sleeve and optional organizers to reformat your backpack for work, travel, overnight gear, tablets and accessories. …and you can exchange our optional padded camera inserts with a supplied panel-wide divider for work, laptops and tablets. 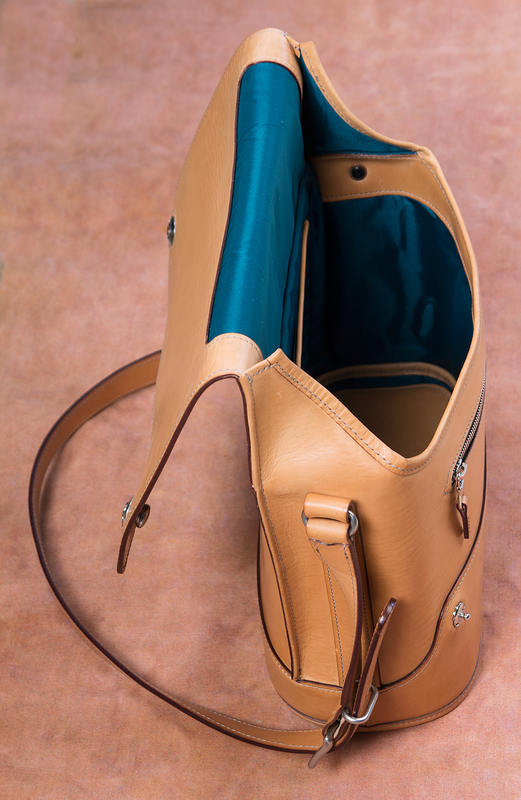 We always customize your bags and organizers to complement the type of gear you need to carry. 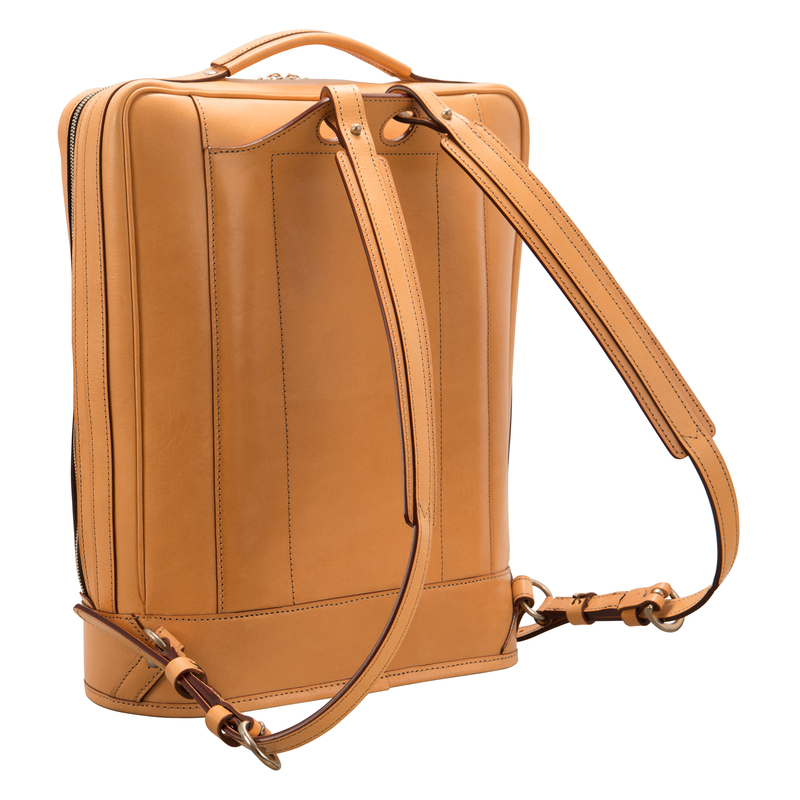 Hand burnished saddle leather: $1200; hand-colored leather $2400. 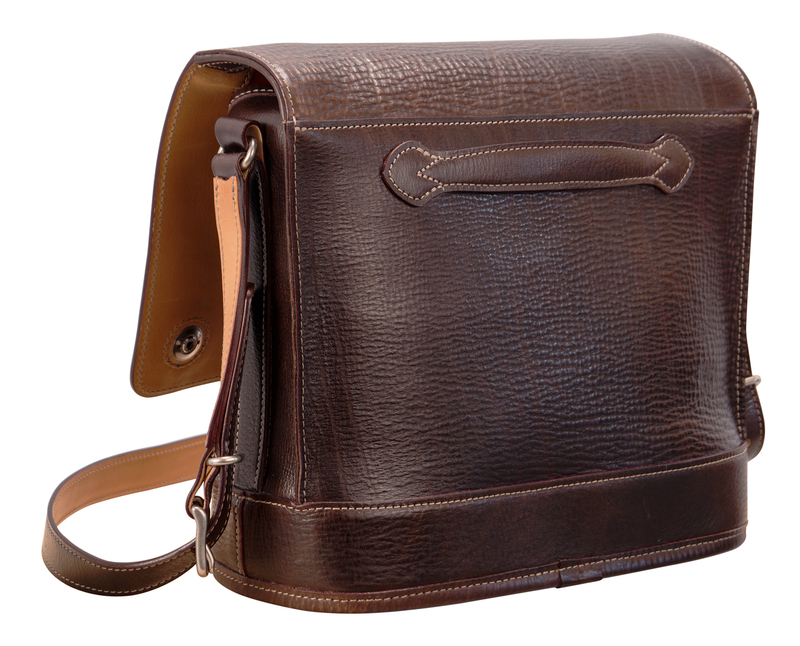 How we work: simply schedule a free Zoom video chat with Kari and Myron to determine the size, format, leather and lining colors, organization and utility of your bag, and we’ll make it for you. 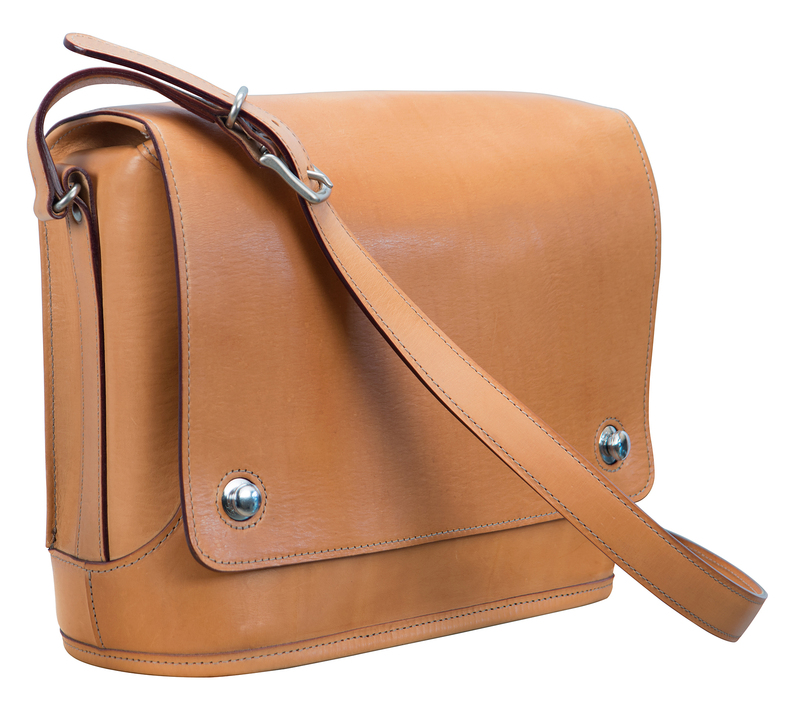 Email w@glaserdesigns.com or call 415-552-3188.
size and format of bag you want and the organization you need. Email w@glaserdesigns.com or call us at 415-552-3188. 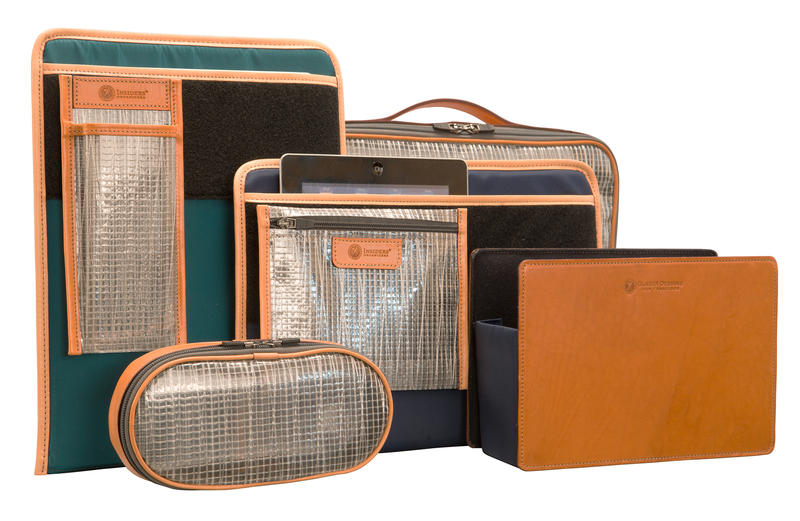 Custom-made Portfolio Organizer to fit and organize your MacBook®, iPad®, laptop, cell phone and stylus. 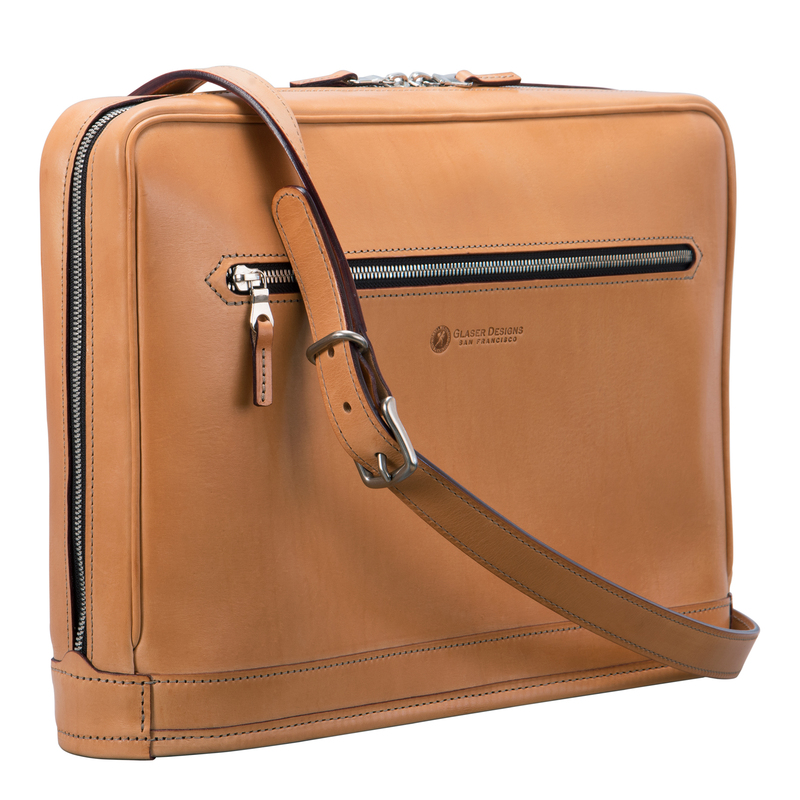 It doubles as a natural-leather portfolio, with custom sizes to keep your electronic gear safe and accessible. With magnetic closure. $495. 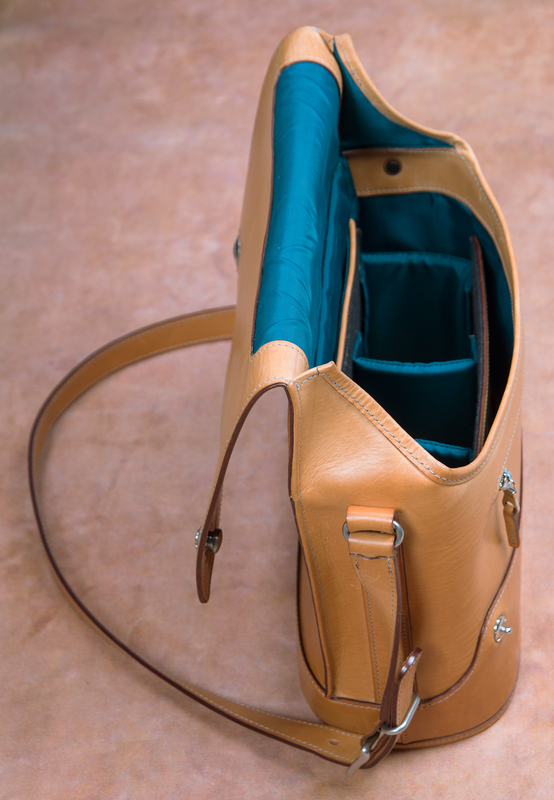 Optional sailcloth and leather organizers to order. We sand and glaze the suede side of the interior surface for moisture and soil resistant. See-through organizers hook to the semi-rigid center panel to position your pens, chargers and cords in view. 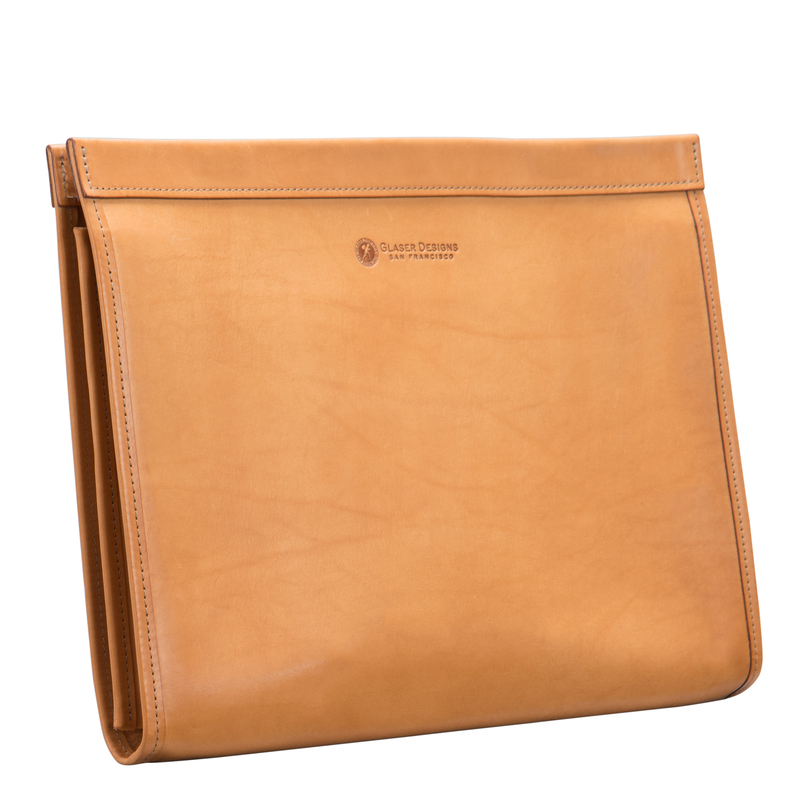 Your portfolio is made of vegetable tanned leather that quickly darkens with exposure to sunight. 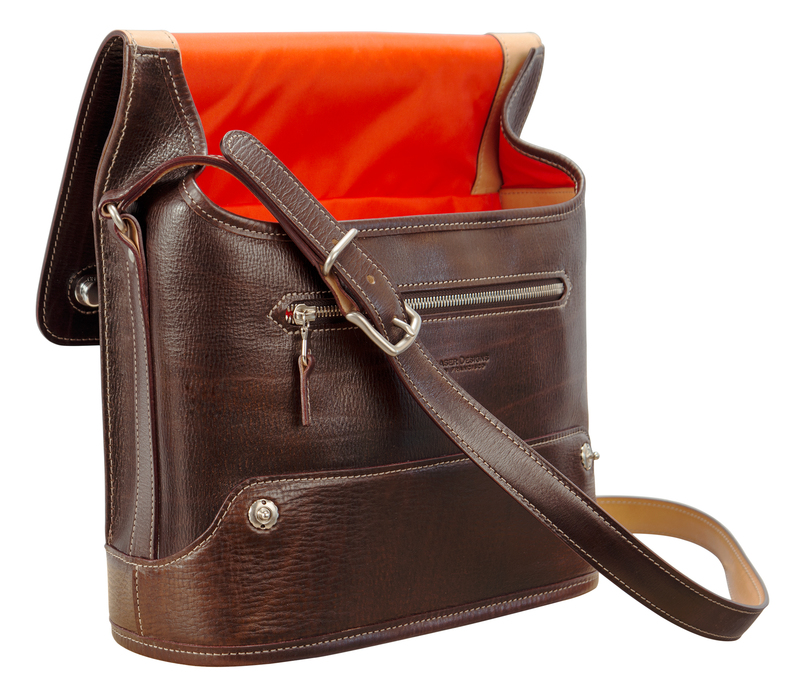 Hand-colored portfolios are available by special order ($990). Portfolios nest within larger bags to protect and organize your gear, and double as meeting and conference bags when that’s all you need. 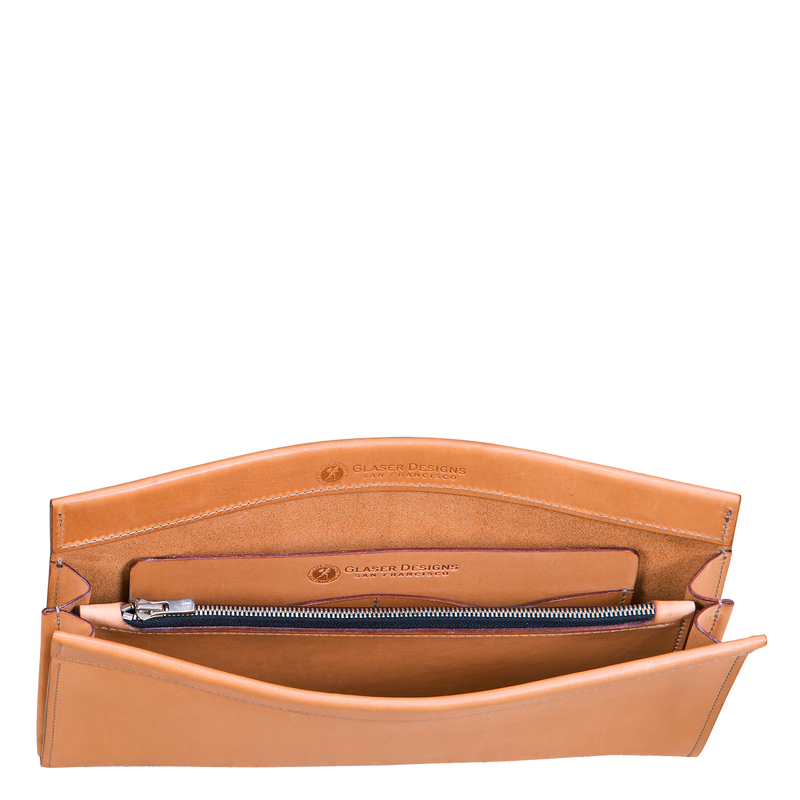 The natural-leather wallet is custom made to organize your phone, cards and currency. With magnetic closure. $275. 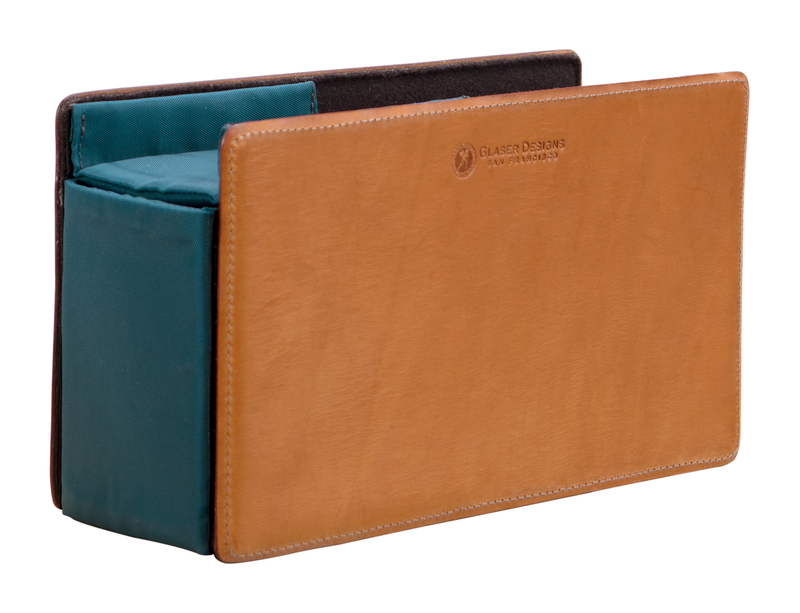 Add a four pocket card organizer for $75. 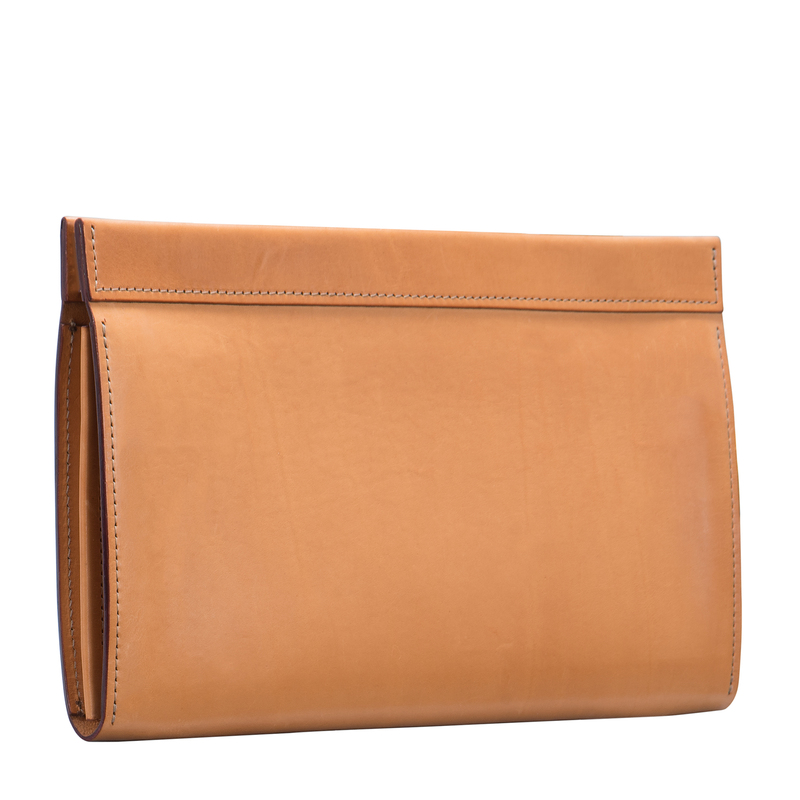 We’ll make your portfolio and wallet from hand-finished, vegetable-tanned leather to make them moisture and soil resistant. Inside your work or travel bag, they protect and organize your gear; carried independently, they’re great meeting and conference organizers. Tell us about what you need by scheduling a free Zoom® video chat with Kari and Myron about the size you want… email w@glaserdesigns.com or call 415-552-3188.
hand-painted interior… hand-cut to fit you perfectly. $975. 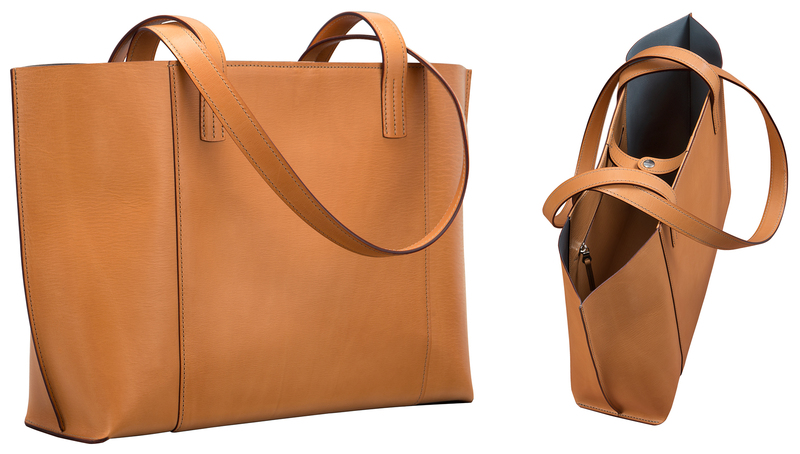 The new Ellie Tote is also available with hand-grained leather dyed with colors studio-mixed to suit you. $1950. for you… email w@glaserdesigns.com or call 415-552-3188. 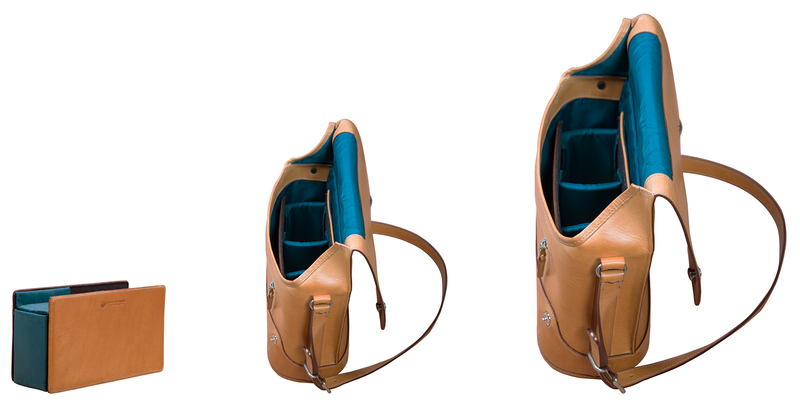 New Platform Cross-Body Bags: made to measure from mini tablet/A5 size through laptop/A4 sizes. 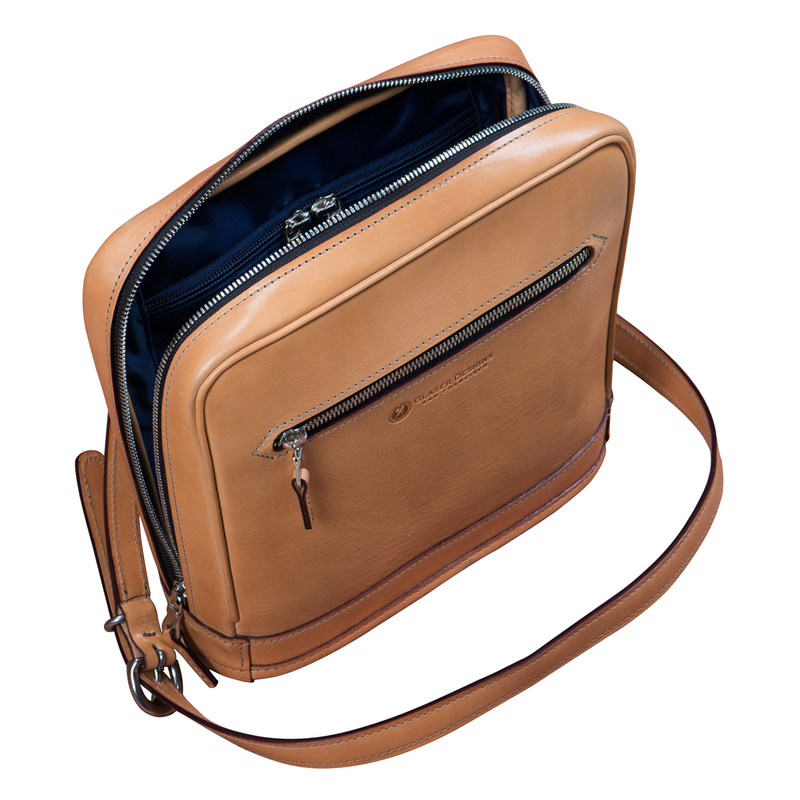 We make our new cross-body bags to order in dimensions you specify to better manage your tablet, smartphone & personal gear. dimensions, and select colors and features. Size range: mini tablet/A5 through laptop/A4, all $750. Hand-colored versions are available for $1500. 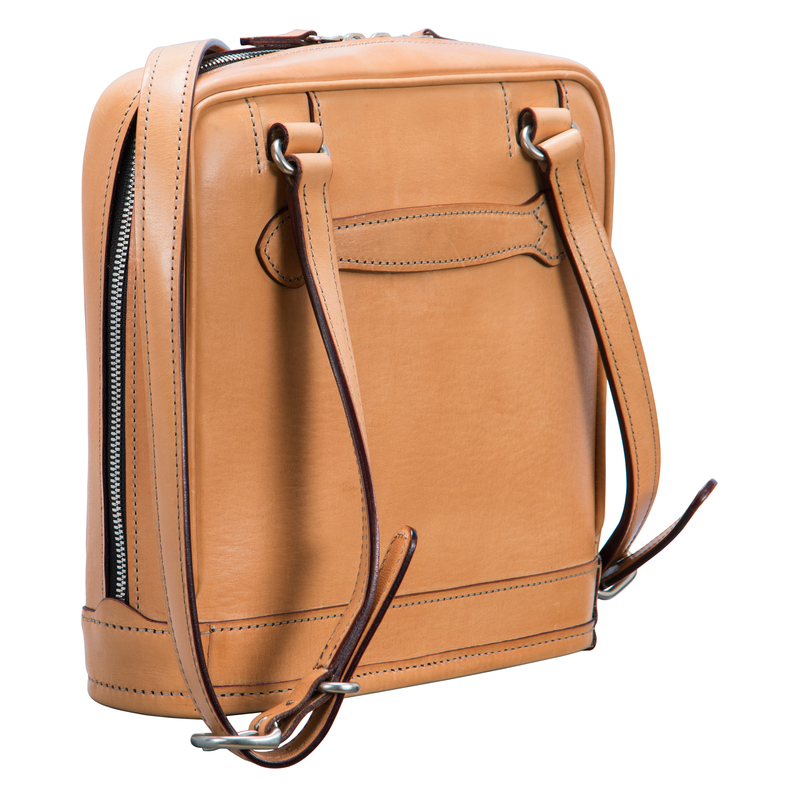 • Your bag will unzip from top center to its free-standing padded base, so you can see all contents at a glance, free of worry that you’ve left something behind. 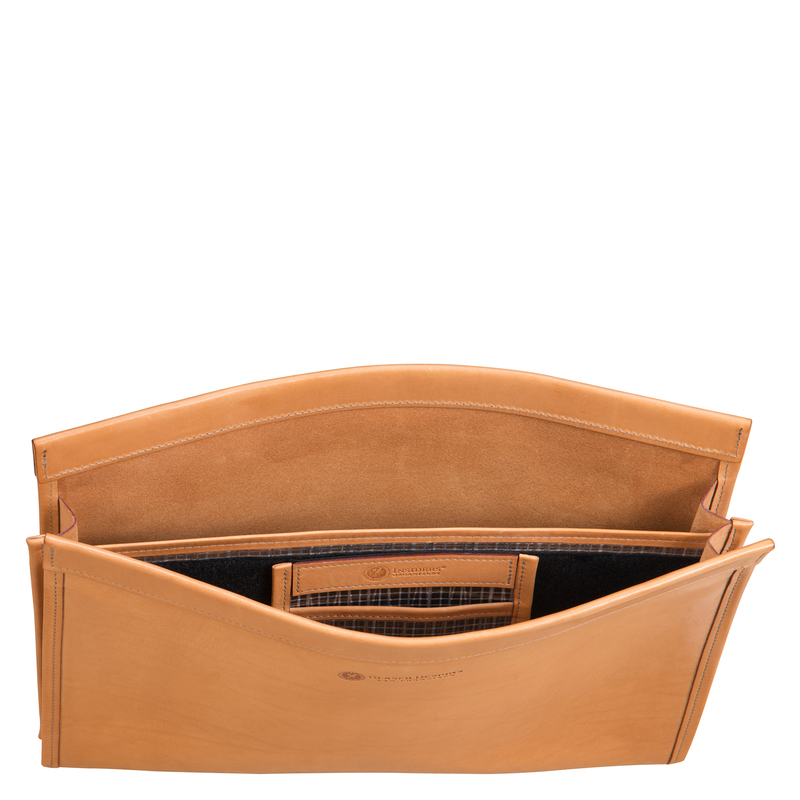 We also make optional organizers in sailcloth and leather to manage your gear tangle-free and compartmentalize your bag for changing technology. could make a customized bag for you. 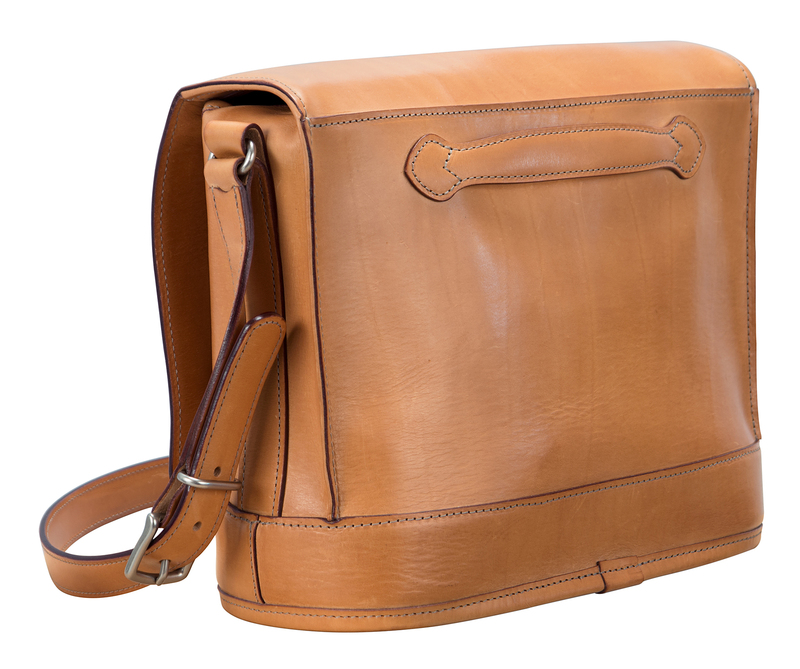 12 x 9 x 5” Platform Flapover Shoulder Bag in Natural Leather). Visit our studio or call (415) 552-3188 to order. 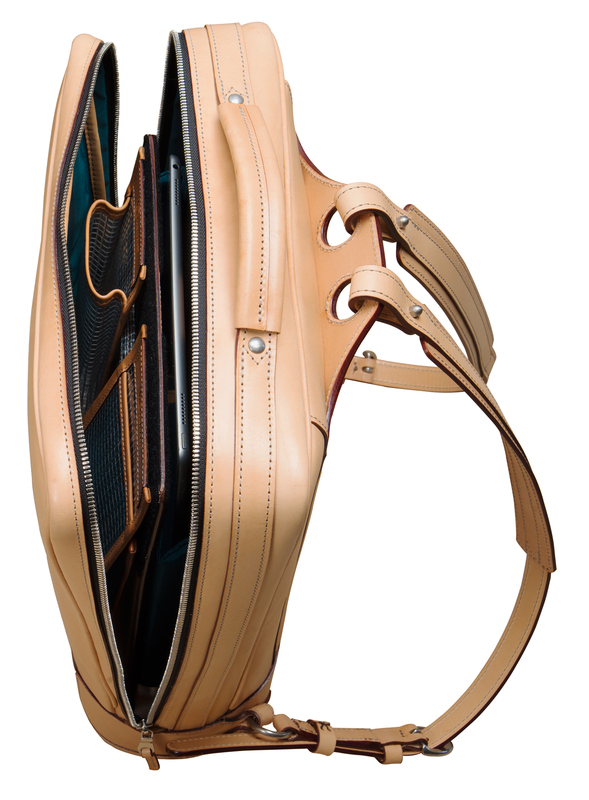 We invite you to schedule a video call to discuss options to custom fit and hand color our products for you. Please call to learn more about our personalized corporate gift programs and custom, hand-colored designs. 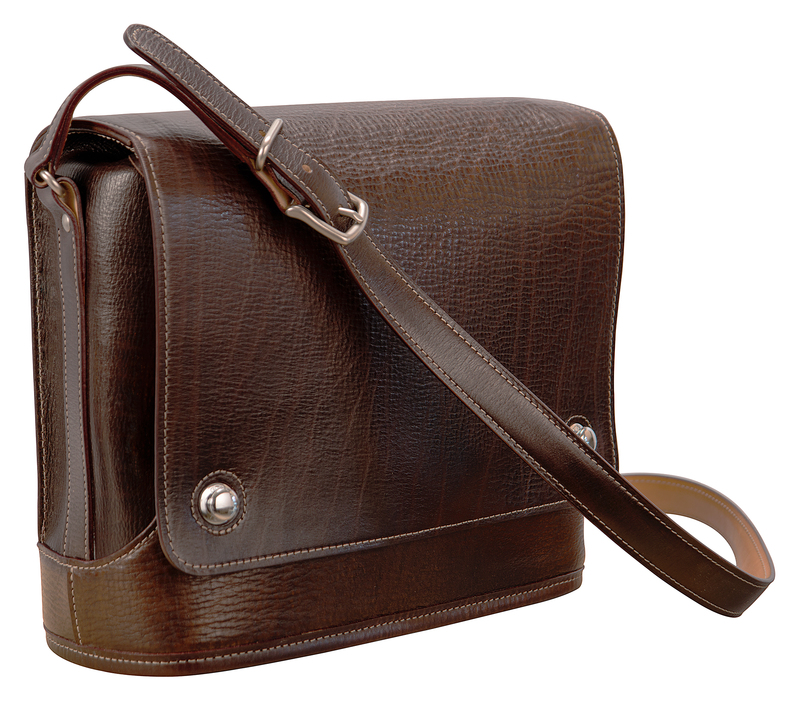 We make your freestanding Platform Flapover Shoulder Bag to the size you specify. 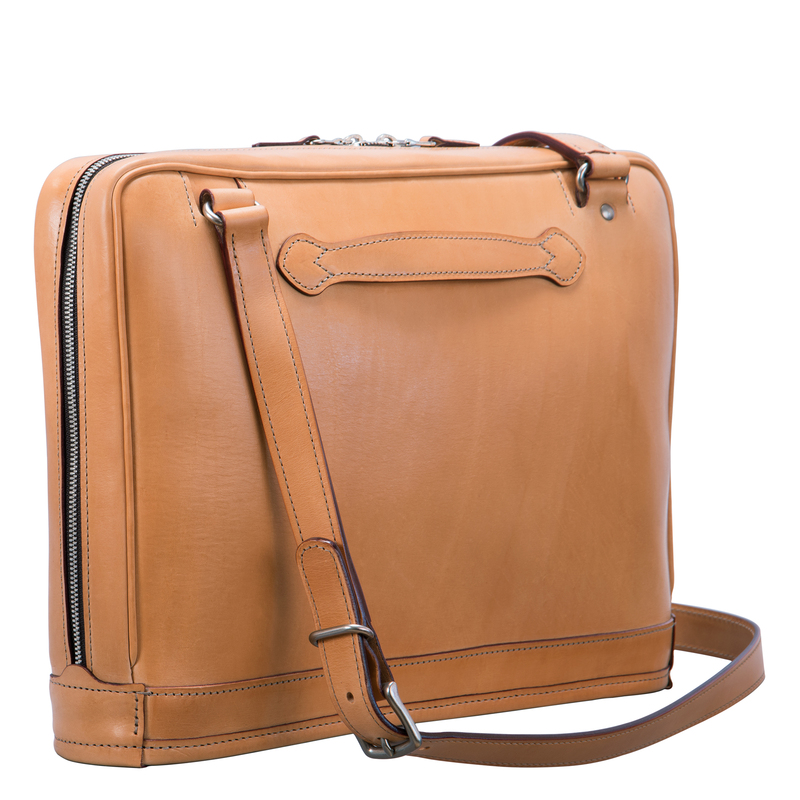 Call (415) 552-3188 to order or make an appointment to join us in a video call to discuss your requirements and the features, leather colors, lining colors, and dimensions you prefer.